Among 4 plates, divide lettuce from salad kit. Mix crabmeat, onions, avocado and salad dressing from salad kit. Spoon over lettuce. Sprinkle with Parmesan cheese and croutons from salad kit. You can use 8 ounces of cooked medium shrimp instead of the imitation crabmeat. 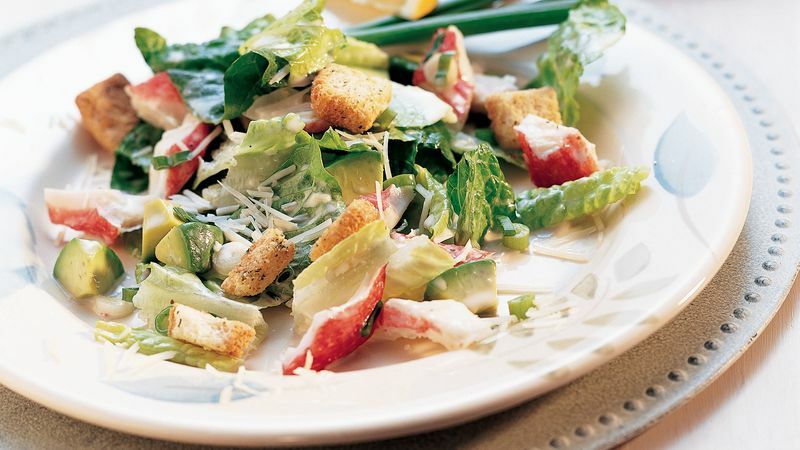 If you prefer, you can use 4 cups torn romaine, 1/3 cup Caesar dressing, 1/4 cup Parmesan cheese and 1/2 cup seasoned croutons instead of the Caesar salad kit. Sprinkle with additional shredded Parmesan cheese.